KABUL, Afghanistan, November 26, 2017 (ENS) – With about 300 sunny days every year, Afghanistan is well situated for solar power, and soon the country will be generating electricity with its first industrial-scale solar photovoltaic array. The Asian Development Bank has approved a US$44.7 million grant to develop Afghanistan’s first big on-grid solar photovoltaic plant to boost the country’s renewable energy generation and supply. The project will finance the construction of a 20 megawatt solar photovoltaic plant in Naghlu, located in the capital Kabul’s Surobi district. The project will partially fill the demand-supply gap and improve sustainability of the northeast grid covering the provinces of Kabul, Nangarhar, and Laghman. “The demand for power is rapidly growing across Afghanistan and economic development and income opportunities depend on sufficient energy supplies,” said Samuel Tumiwa, the Asian Development Bank’s country director for Afghanistan. Only about 32 percent of the Afghan population has access to grid-connected electricity and the demand for electricity in major load centers is growing by 25 percent annually. “The new on-grid solar power generation project, which is the largest of its kind in Afghanistan, will not only provide access to a clean and reliable power supply, but also demonstrate the viability of future renewable energy investments through public-private partnerships,” said Tumiwa. Despite progress since 2002, Afghanistan still relies on energy imports from neighboring countries to meet its domestic demand. Reliance on energy imports, lack of enough power generation capacity, a small domestic market, and financing weaknesses leave energy security “highly vulnerable,” the bank said in a statement. Afghanistan’s renewable energy resource potential is estimated to be over 300,000 megawatts, with over two-thirds of potential supply coming from solar. “Considering 300 sunny days per year with free solar irradiation to generate solar power, it makes Afghanistan an attractive country for implementing solar power projects,” said Finance Minister Eklil Hakimi in the statement. The Asian Development Bank project will generate at least 43,000 megawatt-hours of solar power and avoid at least 13,000 tons of carbon dioxide equivalent in the first full year of operation. The project also will provide power transformer and support facilities, upgrade the capacity of the existing substation, and operation and maintenance services for three years. The project will prepare the site and substation to accommodate 10 MW of additional photovoltaic plant for future financing. The project may be expanded to 30 or 40 megawatts if additional financing from other development partners or the private sector is realized. Capacity building support will be provided for the Ministry of Energy and Water, and government-owned energy utility Da Afghanistan Breshna Sherkat, DABS, staff on solar photovoltaic plant design, technical evaluation, grid integration, and operation and maintenance. Upon completion of the 20MW Naghlu solar power plant, 20,000 customers in Kabul will connect to new electricity. The project is in line with the targets of the National Energy Supply Program of the Government of Afghanistan and the Afghanistan Renewable Energy Policy. The Asian Development Bank is Afghanistan’s largest on-budget development partner in the energy sector. 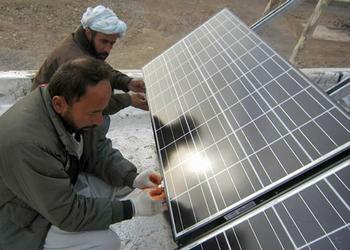 The bank already has helped deliver electricity to more than five million people in Afghanistan. Over the coming years, the bank intends to support the increase in the country’s electrification rate from 30 percent to 83 percent and lift the share of domestic generation from 20 percent to 67 percent by 2030. In September, Indian contractor Dynasty Oil & Gas began work on a 10MW solar photovoltaic project at Kandahar, in southern Afghanistan, with financial support from the United States Agency for International Development, USAID. According to a statement from DABS, the US$20 million project is located at an industrial park, which needs power. USAID provided US$10 million in funding; Dynasty supplied the rest. The Kandahar solar array is expected to start operations in August 2018. These solar projects are part of the Muslim world’s newly pledged dedication to renewable energy. Officials from 56 Muslim-majority nations came together in September to pledge new climate-related technology goals such as microgrids, energy storage and renewable energy targets. The Islamic world’s first science and tech summit in Astana, Kazakhstan, attracted heads of state and government ministers from the 56 nations. The summit included the presidents of Turkey, Pakistan, Bangladesh, Uzbekistan and Afghanistan among other nations of the Organization of Islamic Cooperation States. The 56 countries pledged to reduce greenhouse gases by 2025 by adopting the goal of at least 10 percent renewable energy shares of in their national energy mixes. They also plan to introduce microgrids and encourage stand alone distributed renewable energy systems for small communities.